The first monthly Kids' Junket!!! Once a month our community has a Kitchen Junket, which basically is a gathering of musicians, poets, writers, and performers/revelers of every ilk, who gather to make musical merry. We love it. It is usually the most highly anticipated event of the month for our kids. The music begins at about 9PM, at the earliest! For our kids this is no big problem; being homelearners has given us the freedom to be late-risers, and therefore the kids generally stay up until 9 or 10. It's not much of a stretch to have a nap in the afternoon and stay up until 1AM, enjoying a junket. So we do this once a month! We treasure our flexible bedtimes, and the cultural and familial opportunities they create for us. Unfortunately, our many young friends who'd also like to attend the junkets do not have such flexible sleeping schedules, and are rarely able to join us. No Problem!! Taliesin, Rhiannon and CJ have solved the problem! From now on, every time a junket happens, they'll hold their own "Kids' Junket" on the afternoon of the same day! Here is evidence of the first junket: November 19th, 2010. 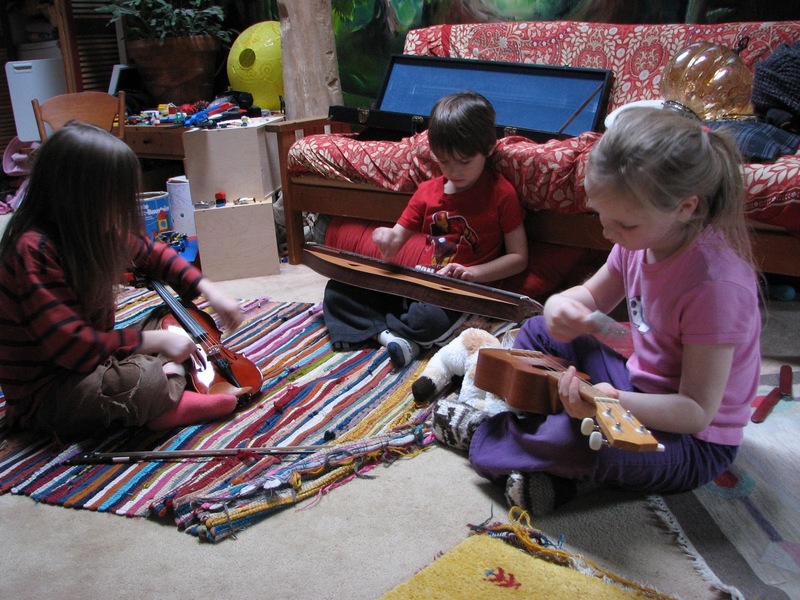 Left to right: a violin being played leaning-cello-style with one hair from the bow, a mountain dulcimer being played the traditional way, and a ukulele being strummed like a lap dulcimer with a folder piece of paper. Our junkets are necessarily creative!! 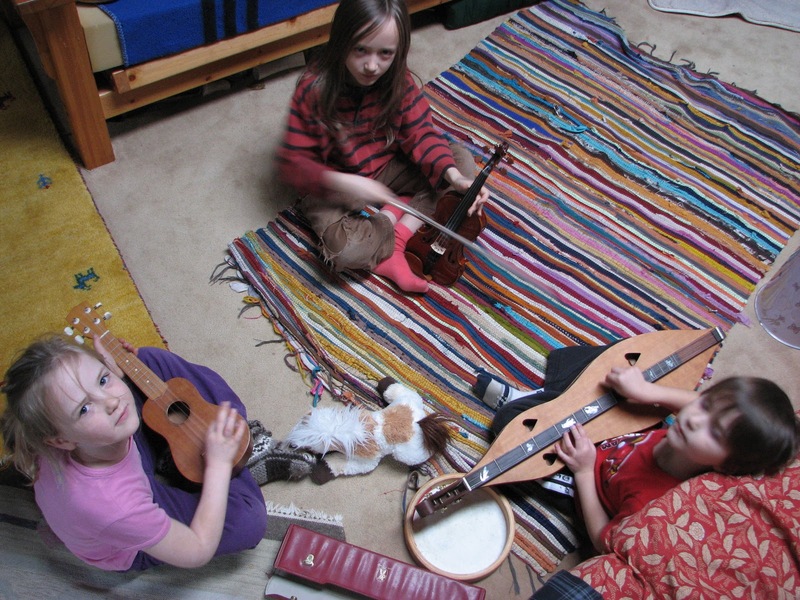 Why a good preschool is a perfectly natural part of Unschooling. I am certainly not unbiased. This is about my mother, and I think my mother is just excellent. She has devoted her life to children's development and welfare, has been a preschool teacher, a music therapist, and an infant development consultant, just to name her major careers. Now she teaches preschool once again on our Island, at our local (Reggio Emilia) Bowen Children's Centre. She brings not only great passion, dedication and concern to her work, but also the knowledge of an educated woman who has spent nearly 40 years learning about how children grow and thrive. And she cares. Most parents do not have the background to know why our children behave and develop the way they do. There are doctors and therapists to help us with their bodies and specific issues, but even then, we often don't know when it's time to pay them a visit. My mother pointed out very early on that my daughter was having difficulty standing, and, because physical development is not her specialty, suggested we take her to an OT or Physiotherapist who specialized in infants. We did, and a few months down the road she was well on her way to having her hips facing the right direction. She's fine, now, thanks to an early intervention that I myself would never have known was needed. So it's a treasure to have a teacher (and grandmother, in our case!) whose insights into our children can help us to help them more. Her explanations, especially about their intellectual, social and emotional development, have made clear many confounding situations we've faced. Many parents have been surprised to hear that my children attended preschool, when I consider us to be unschoolers. Unschooling isn't about shunning the rest of the world; it's about giving our children the gift of freedom to follow their own paths and to nurture their own authentic selves. There is no better place to do that than in a preschool where they can engage in all sorts of various types of play with various different children, where their thoughts and experiences will be celebrated, encouraged and shared, and where they can learn to do all of this opening up to the world in a safe, supported way. Once upon a time, when my mother first taught here, the Bowen Preschool was called the Bowen Island Child Enrichment Centre. Doesn't that just sound so much like what we want for our children? Times change, and apparently the name did too, but that beautiful child-centred name still expresses the core of what the place is: A place to enrich our children's lives. Not despite, but BECAUSE of being a wholehearted radical unschooler, I wish that all parents had the option of bringing their children to a preschool like ours (where, yes, parents are welcome and encouraged to stay), to engage their children in thoughtful, social activities with dedicated caring professionals and other children, and to learn as much as I have from these dedicated professionals. My mother is certainly not the only preschool teacher out there with a good education, a lot of experience, and an honest loving dedication to what she does. But too many people are unable to give their children the experience of a good preschool. I hope that, as our species matures, we will value infant development and the knowledge that could make us wiser parents and caregivers, enough that one day the excellent preschool teachers of the world will be lauded and supported for their truly essential gift to our future generations. As adults, we like to say that “Play is a Child‘s Work”, but what do children say? Generally, regardless of the activity, children say that “If they choose to do it… it’s play and if they are asked to do it… its work”. “Quality play time” is play that is rich in child-initiated activity. These activities may be guided or enhanced by parents and educators, but the essential learning component is that they are the product of the child’s interests. Child initiated play pays attention to the process of the play. It is not a means to an end. Adult initiated play reduces a child’s opportunity to make rules and define the process. Curiosity is driven by authentic questions and hands on learning. Authentic experience allows the child opportunity to predict, experience and evaluate. Children’s play grows and matures in a predictable way. There are four play styles that early childhood educators use to define different styles of play among children. Play styles progress from one form to the next and all styles of play overlap with each other. 1) The first independent play of children is Solitary Play. Solitary play (such as object play) allows the child to investigate, make discoveries and builds a cognitive structure of understanding which supports other styles of play. Once a child is able to play alone he/she will begin to watch the play of other children, especially those of a similar age or developmental level. 2) Observational Play (i.e. one child watching another play) builds a social understanding on which a child may begin interaction with others. 3) Parallel Play (two children playing the same game, side by side with little interaction except to exchange toys) allows a child to use the skills gathered in solitary and observational play to prepare for social integration. Parallel play scaffolds children into socially co-operative play. 4) Complex Socio-Dramatic Play (interactive role play between children) allows children to rehearse social activities and refine social skills such as how to join a group and how to accept a delay in personal gratification. This style of play is the type of play that most adults remember from their own childhood. Although Physical Play is not generally considered a play style it has a unique and important role. Physical play enhances children’s understanding of their bodies as they work to master skills (such as hanging on the overhead ladder and kicking a ball). They watch others engaged in similar physical activities to help them understand technique and work together with other children toward organized physical games (such as catch and tag). For many children the kinaesthetic nature of their play makes this the most effective avenue for learning. In Early Childhood centres that offer daycare and preschool, children learn from their natural activities in an adult organized environment. Children in this environment develop a social understanding of their role, their abilities and their power as they begin to understand what is in the minds of others. What is the Adult’s Role? Authentic play is an indicator of a child’s health and well-being. Play and learning are one and the same thing and cannot be separated as play is truly how children learn.